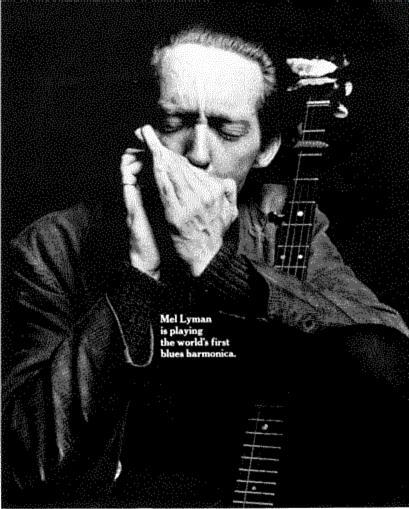 Mel Lyman Hohner Blues Harp ad from the 1966 Newport Folk Festival brochure. Until now, harmonicas just weren't made for blues. For one thing, they didn't last. After two or three blues sessions it was tough even for a musician like Mel to get a good sound. The punishment of blues wailing often caused the reeds to lose pitch and flat out. Now you've got the blues harp. With a new kind of reed system. And you can get a great blues sound with a minimum of effort. Mel said the Blues Harp was the best harmonica he'd ever played. See if you don't agree. Thanks to Doug Thompson for sending me a copy of this.